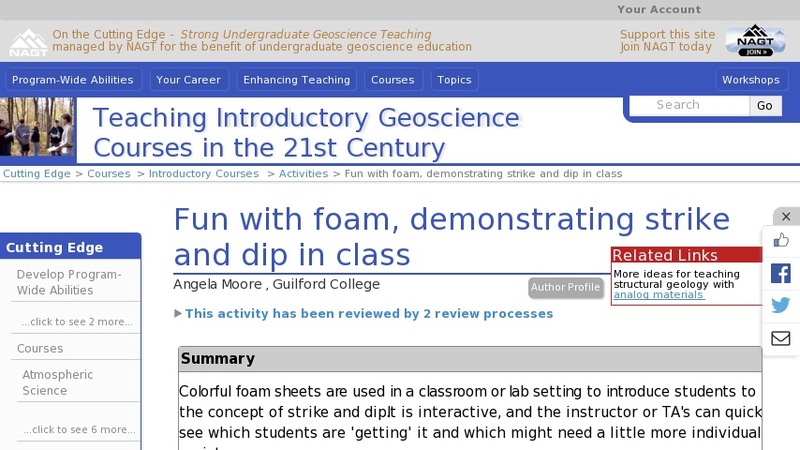 Colorful foam sheets are used in a classroom or lab setting to help students understand the concept of strike and dip. To prepare for this exercise, students should be introduced to the basic concepts in a short lecture beforehand, and perhaps shown diagrams to give them a general idea of what the terms mean. The instructor will need to identify the N,S,E,W directions in the classroom; it is usually helpful to post sheets with this information and attach it to the walls. The students are then asked to use their sheets of foam to simulate the orientation of beds that are have a specific strike and dip. Once that has been mastered, the exercise can be expanded and students can be asked to demonstrate the trend and plunge of simple folds.